ZVISHAVANE - Society should accept that just as anybody can get medication and assistance for any health challenge without facing stigma, the same can also be done for people with mental illnesses, a newly-formed mental health lobby group has said. 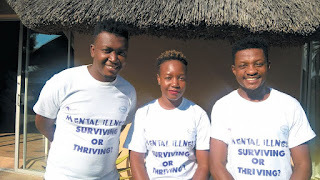 Ropa Muzari, director of the Bindura-based Afr-I-CAN in me, says she wants to draw attention to the plight of people living with varying degrees of mental health challenges. She says mental health issues have either received far less than enough attention in the past or have largely been neglected altogether. Her organisation, which was formed in January, held a seminar in Bindura last weekend and offered counselling sessions and there are plans to take the work to other parts of the country. "We want to see society being more tolerant to people with mental illnesses and we want our generation to have the best mental health conditions. We are out to stop the stigma and help people to learn to develop the same attitude for mental illnesses as they have for other kind of illnesses" said Muzari. She said Afr-I-CAN in me was borne out of her own personal history of suffering with mental health issues from a time when she was still young. As somebody who grew up with mental health problems, Muzari said she had noticed that it was difficult for sufferers to speak out due to the discrimination and stigma that society attaches to such cases. She realised that some social problems like suicide and severe cases of mental illnesses were partly caused by unreported cases of mental health problems. Afr-I-CAN in me, she says, comes with a determination to spread awareness through projects that conscientise communities through education.